If you enjoy athletic events that provide an excuse to travel to a fun, beautiful holiday location, then you need to hop online and sign up for the Byron Bay Tri, which takes place Saturday, 12 May. Now in its 23rd year, the very popular Bryon Bay Triathlon wraps up the triathlon season for the Queensland/NSW area and typically attracts around 1,000 participants each year. Athletes in the Olympic track will swim 1.5km through the well-known waters of Byron Bay, cycle 40km on two 20km loops, before finally running 10km through the streets of Byron Bay, near the iconic Lighthouse. It is one of the few triathlon events that begins midday, with the kids’ waves starting at 11:30 am following through to the Olympic level. Individuals may register for this 2018 Byron Bay event at either the Olympic level, Sprint (race amounts to 750m swimming, 20km riding and 5km running) or Tempta (race amounts to 300m swimming, 10km cycling and 2.5km run). The cycling portion of the race was redesigned in 2017 and has been tweaked again for 2018 based on feedback from last year’s participants. In addition, the Byron SLSC will be on hand again to provide support during the water leg to make sure that portion is safe. This year after last year’s success, the event will include a kids triathlon where young kids swim 100m, big kids do 200m; young kids will do 3km of cycling and big ones will complete 6km; and then young kids will run .5km, while big kids will finish the event with a 1km run. Also, there is a fun results party in the evening, held at the Byron Life Saving Surf Club starting at 5 pm. Because this event takes place in the gorgeous Byron Bay and it’s the end of the triathlon season, it is a good reason to load up the family and take in a holiday while you’re in town for the event. Imagine spending the week after the race soaking up all that Byron Bay has to offer from pristine beaches, to amazing hinterland. There will be road closures–be sure to check this list–so it’s a good idea to park further away and walk over to the Byron Life Saving Surf Club to nab a place to view the swimming section. Another option would be hang out along the cycling area, which covers 20km, and runs along the Byron Bay/Lennox Head coastal road. The cycling portion begins at the Denning Park transition area and comes back to the same area to complete the race. Or, perhaps the best thing, is to head to the run area, as the race returns to the start for the finish, and loops runners around the course four times before finishing. This would give family several chances to cheer competitors on during the run. A fun idea for family members is to see competitors off at the beginning of the race and then head to the Lighthouse walk, which you can pick up at nearby Lennox Street, to see one of the most famous attractions in the Byron Bay area: the Byron Bay Lighthouse. This lighthouse sits at the most easterly point of the Australian mainland and provides stunning views of the area and of the ocean creatures that inhabit the area. We talk about this, and other activities, in our post 24 hours in Byron Bay, a great source of information for those who want to have a short Byron Bay holiday break. The Byron Bay triathlon is considered a favourite among many athletes who come back year after year to do this competition. The start time of midday means no cause for early rising and afterwards competitors and their families often stay on to enjoy the rest of the festivities and a relaxing break in Byron Bay. If you’re interested in competing, here are a few blog posts from professional athletes about the race over the years. Choose accommodation that is truly away from the busy town centre and will give you a place to relax before and, most importantly, after the triathlon. 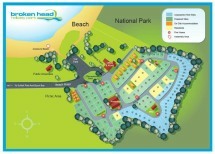 Broken Head Holiday Park offers a great atmosphere with a beach nearby and accommodation the whole family can enjoy. Plus, our Byron Bay budget accommodation won’t break the bank for a holiday stay after the event, giving you yet another reason to take the plunge and sign up for the race and bring your whole family to experience all that Byron Bay has to offer!